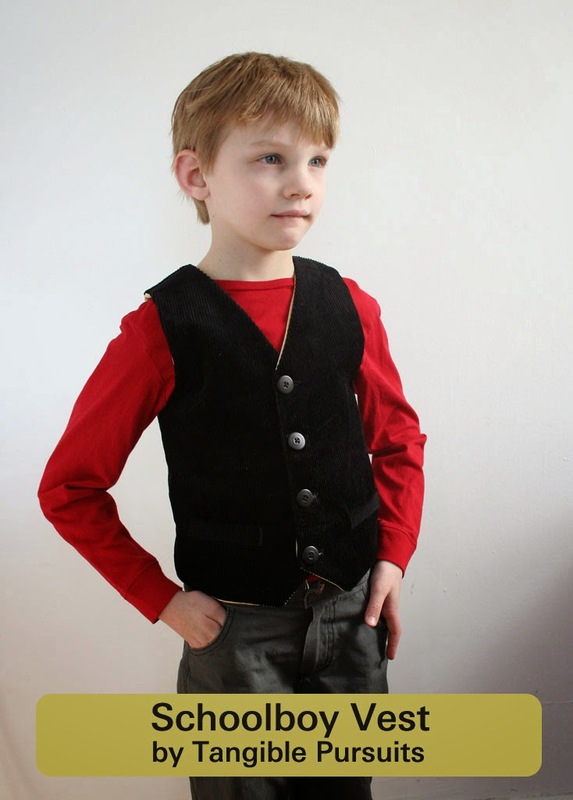 I had the opportunity to test the Schoolboy Vest pattern from Sew Much Ado. 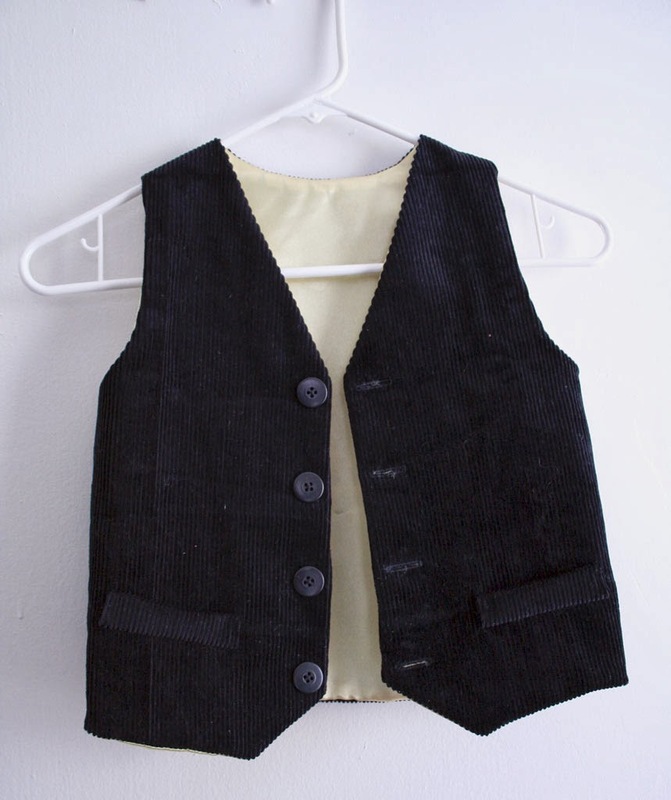 It is a fully lined vest with real or faux welt pockets and back ties. I made one for the big kid in a black wide-wale corduroy with a yellow satin for the lining. I wasn't sure he would be in to the style, but yellow and black is one of his favorite color combinations so I was hoping to win him over with the color choices. I was really impressed with how the pattern came together. I don't think I could have figured out myself how to line the vest without having to finish the armholes separately later. It is a very polished looking vest. I did the faux welt pockets, but definitely could have done the real welt pockets - the instructions were very detailed and clear. For the back ties, I found that my wide-wale corduroy was too thick to fit through the buckle so if you are using a thicker fabric you may want to just leave the ties off. Due to user error I actually made the big kid a size smaller than I intended. Luckily my big kid is pretty skinny and actually measured closer to the smaller size in width anyway , but, if I made this again I would definitely make the bigger size for the length. 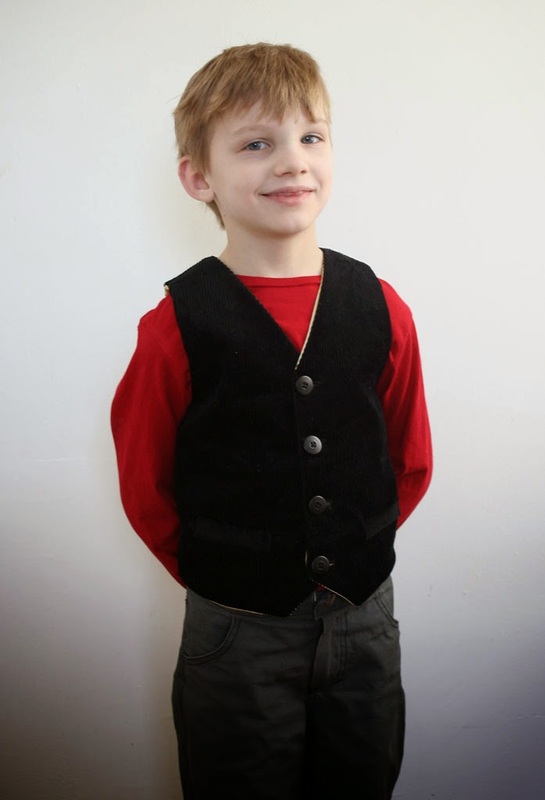 Despite the color choice the big kid isn't really a fan of the vest - he's just not into that style. He also doesn't really like buttons, so if I made him another one I would use snaps instead of buttons. I would definitely recommend the pattern though if your kids have occasion to wear more formal clothes or just like to wear vests. If I need formal wear for either of the boys, I would definitely use this pattern again. I love the corduroy so much Emily! And I'd love to see how it turns out with snaps, I think my boys would love that too!